Victory Parade in Red Square, Moscow. The Russians celebrate their "VE Day" on May 9th. Once again, they put on their usual impressive display of precision marching and hardware...fittingly led by a lone T34/85. The Russkies cannot be denied their moment patriotic triumphalism because Nazi-ism was effectively destroyed on the Ost-Front, and purchased by the blood of 20+ million Soviet citizens. Re: Victory Parade in Red Square, Moscow. 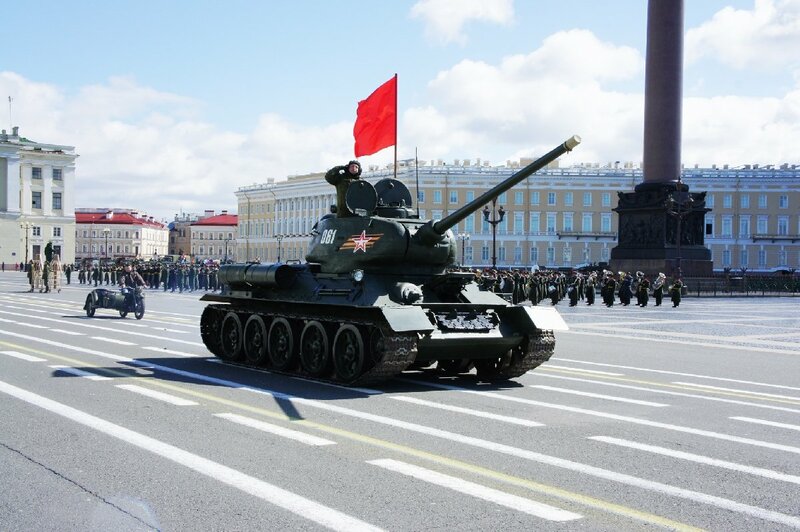 The Soviets always do a good parade. I like how everyone is smiling as they march buy. Yes...I noticed that too...but probably not quite "spontaneous"?! Kim-Jing-Un's parade had more razzmatazz, but the Russkies look more business-like...if you know what I mean? What's with the old Soviet "Hammer and Cycle" insignia. I thought Russia gave that up after the wall came down. Guess "ole Vlad" likes to hang onto the past. THE ALLIED MILITARIA FORUM...... "The freedom forum"! FREEDOM OF SPEECH.......FREEDOM FROM FEES.....FREEDOM FROM DONATIONS and SOLICITATION. Harks back to WW2 I suppose when they fought...and won...under that symbol.